We close the show on Saturday, June 16 playing from 4-6pm on the Green St. stage in the parking lot between Stockton and Grant. Pleasantly nostalgic: I am a native San Franciscan, born in the Haight, spent most of my school years in the Marina. I grew up with Italians. North Beach was one of my teen age haunts. I have always loved its proximity to the bay, its hills and views and the cable cars running through it. 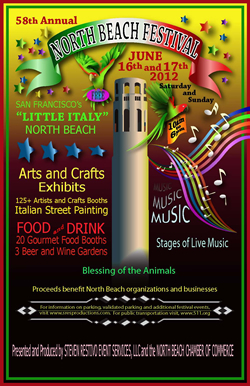 free, live music, North Beach, out of doors.